Zombies invade L.A.’s Chinatown this Halloween during a special one night only event! Fifth Floor Gallery hosts the Rogue Artists Ensemble who will engage in live puppet performances and provide a zombie make-up station. The night includes openings at many of the Chung King Road galleries on the night of the event. 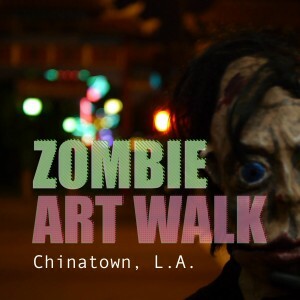 Hordes of the undead will walk the streets of Chinatown, enjoying an evening of art! The Rogue’s famed ‘Visitor’ puppets who starred in their D is for Dog production will Emcee the event at Fifth Floor and will include special performances of an original shadow puppet performance titled “How to survive a zombie invasion.. in Chinatown.” Video displays of Rogue’s past projects will be projected on walls in Chung King Court and there will be a Zombie-Transformation makeup booth that will enable anyone to be mutated into the undead. Come dressed as a zombie and celebrate Halloween in Chinatown with Fifth Floor Gallery and Rogue Artists Ensemble. Some proceeds from the event will go towards supporting Rogue Artists Ensemble’s Pinocchio project. Rogue is a not for profit theater company who has been creating original Hyper-theatrical works in Los Angeles for over ten years. On view the night of the event in the Fifth Floor Gallery space is “Inside Out” sculptures and drawings by Elyse Graham. There will be a special all black-light viewing of her florescent geodes and drawings.